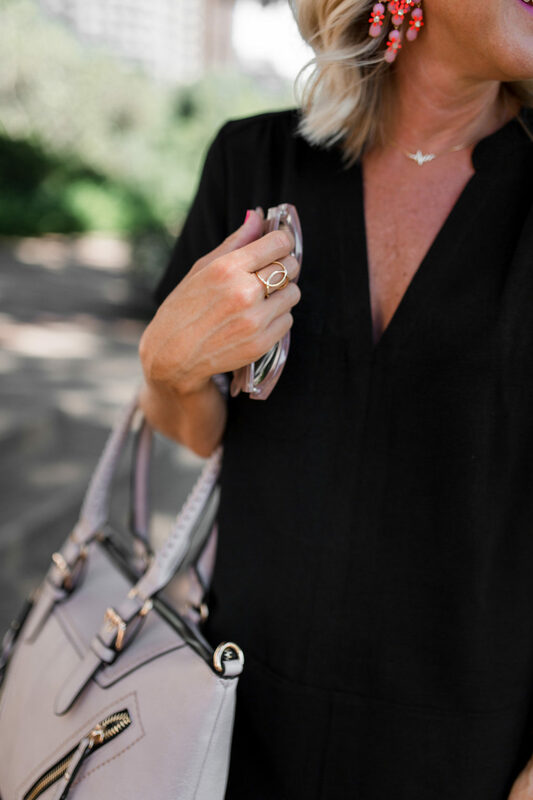 Work to Weekend | Little Black Dress | hi Sugarplum! Every so often, I stumble on the perfect dress. A dress that fits all the major criteria…universally-flattering, suitable for all types of occasions, easy-to-wear, and oh yes, affordable!! This is not a drill, friends…you’re going to want this dress! Perhaps in more than one color (in comes in 7!)!! Did I mention it’s under $50?! 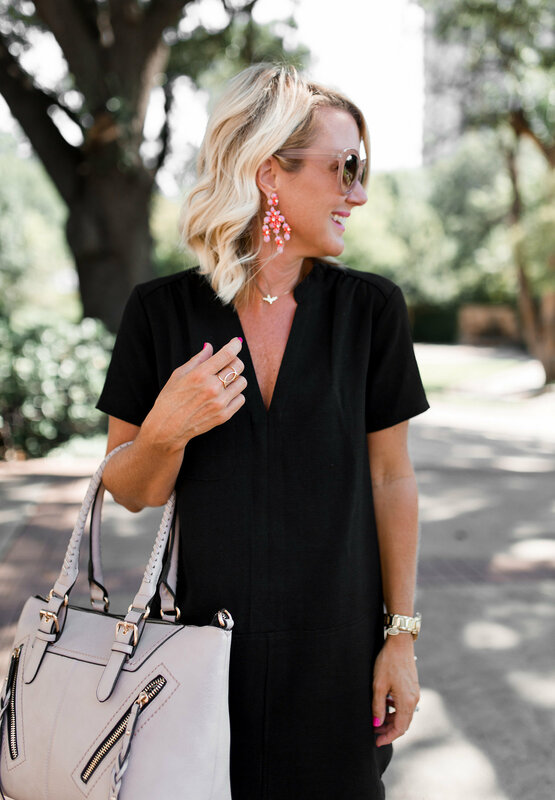 It may be simple in design, but thanks to the slip-on classic silhouette, you’ll feel instantly ‘dressed,’ and the crepe shift easily transitions between casual and dressy. The modest hemline makes it perfect for work and church, but the split-neck gives it enough sass to move into party and nighttime mode. 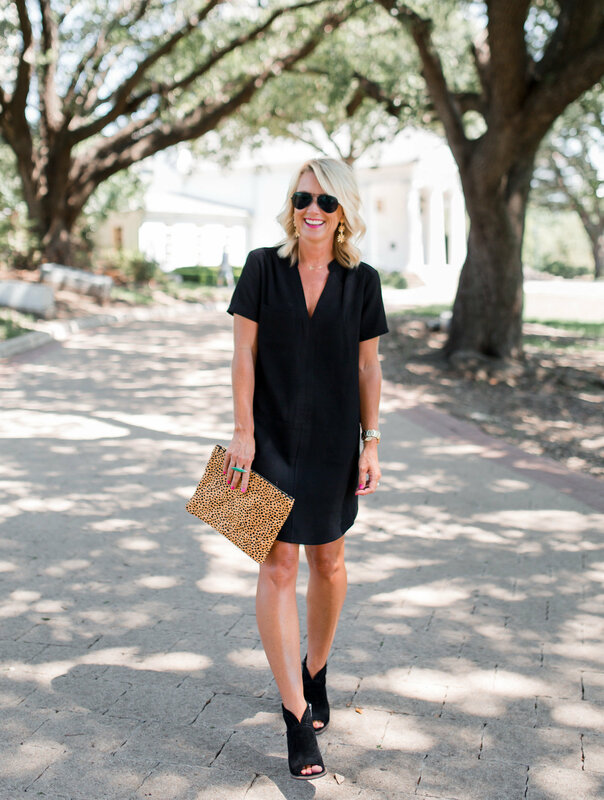 For today’s post, I’m sharing this Goldilocks of LBDs for Work to Weekend. By adding a classic pump (these are my favorites…completely comfortable and not too tall!) and handbag, this modest dress is ready for the office. 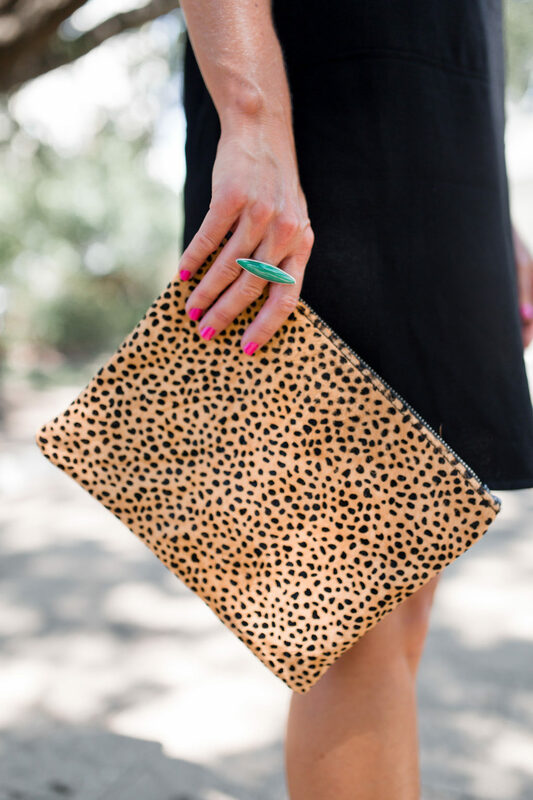 Jazz it up with some fun statement jewels for extra punch. When the temps cool off, I’ll add a long cardigan like this one, or even a military jacket. Fit Tip: The dress is true to size, I’m wearing an XS. Speaking of jewels, my friends at Ben Bridge Jeweler invited me to try out a few pieces, and I was instantly smitten with this heart rate necklace. I don’t think I’ve taken it off since I received it! Mr. SP and I celebrate our 20th wedding anniversary next year, and he’s insistent I either add a band to my wedding set, or get an eternity ring for my other hand. Ben Bridge Jeweler has a ton of stunning options, and I love that they follow the strictest ethical and quality standards, so we’ve been looking there. Do you have any thoughts on anniversary pieces? 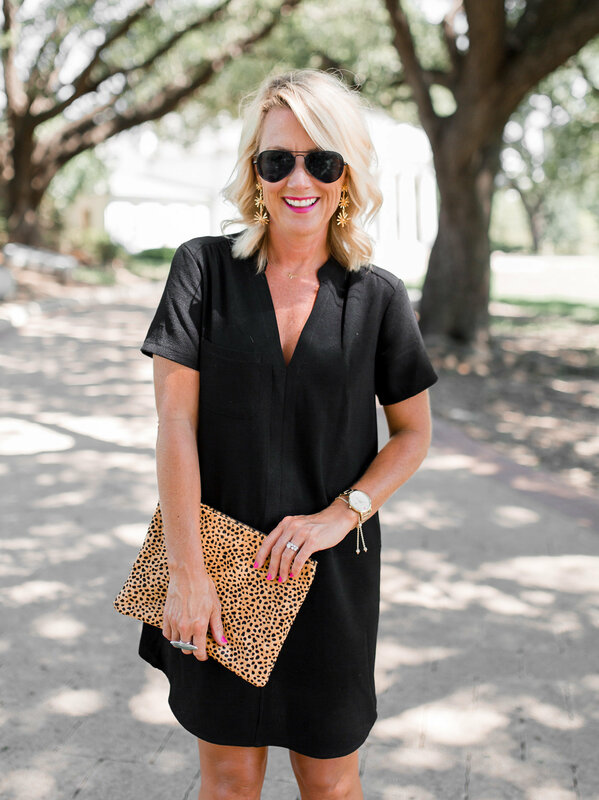 I swapped the pumps for peep-toe booties, and traded the pink tote for a fierce leopard clutch…and just like that, I’m ready for a fun night out! Lipstick is one of my favorite accessories, and this bold pink (color: Punch) really jazzed-up the outfit. I’m obsessed with this new formula…it goes on like a creamy balm, but wears all-day like a stain. I’m working on a beauty post for later this month, and you can guarantee this lipstick and this mind-blowing mascara will be included! I’ve already ordered this dress in both navy and maroon…I hope it arrives in time for a bridal shower I’m attending this weekend! And as for undergarments, my favorite undies are seamless with this dress, as is my go-to bra. 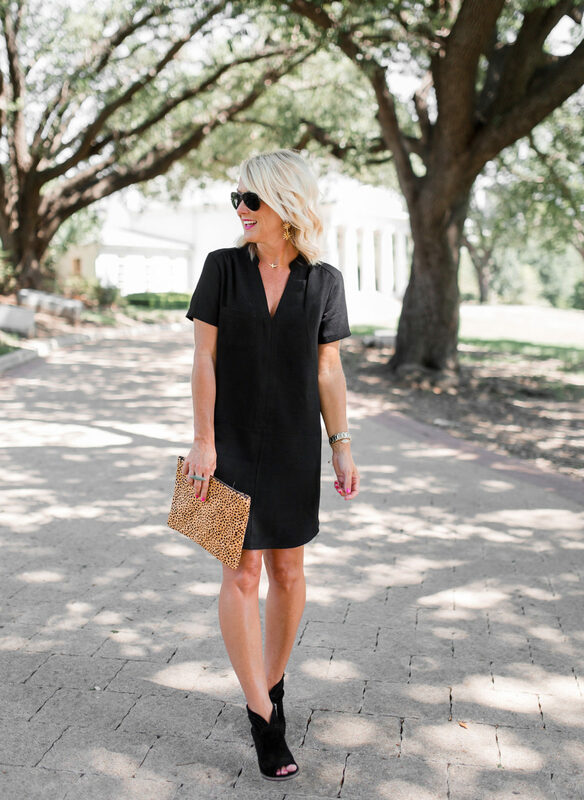 Love this little black dress so much more than the usual ones I see – the cutting is so casual and minimalist! 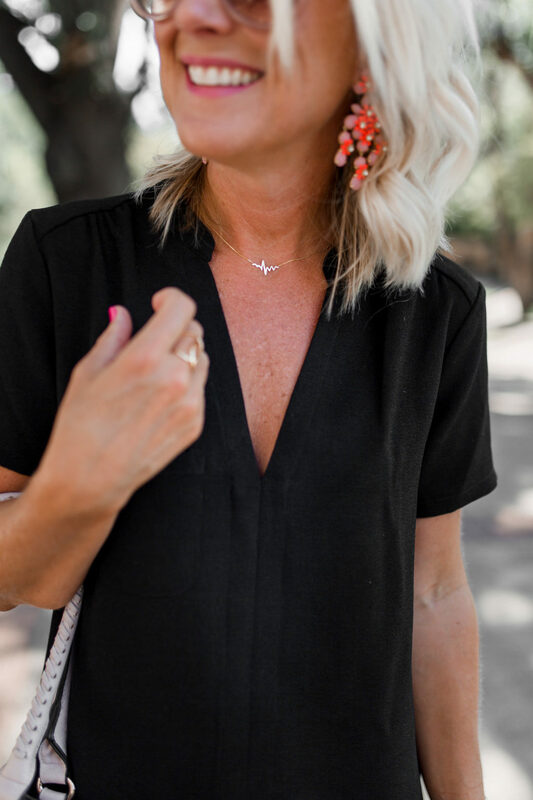 The dress is perfectly simple and that necklace is so unique! I started wearing Bobbi Brown mascara awhile back and love it! Still on the hunt for under eye concealer that doesn’t crease. I’d love suggestions in your beauty post if you have a good one! I’ve been using the creamy Nars concealer, and so far I love it! Those black booties work (it) so well. Okay, just an idea here, no expert opinion-I wonder what a long sash or scarf wrapped in front and around back, then tied in front, kimono style would look like, or a soft leather sash belt in the same black or accent color? Anything goes! It is a hip-modern-minimalist look the way it is tho. Nice! As for jewelry, we just celebrated our 20th anniversary in Santorini and my husband bought me a piece of jewelry there. Every time I see it or wear it, that’s what I think of. 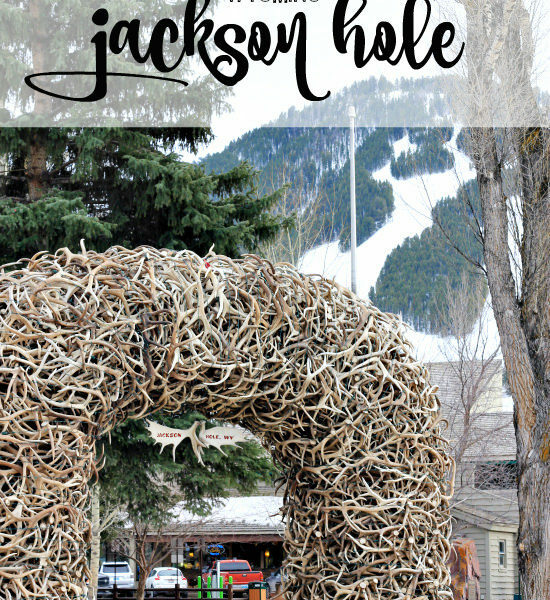 I figured since you guys travel a lot, you may be taking a trip for your big anniversary. Pick up a piece of jewelry wherever you go- Santorini, well Greece in general, has gorgeous jewelry! It will be something different and equally as special! Too cute! 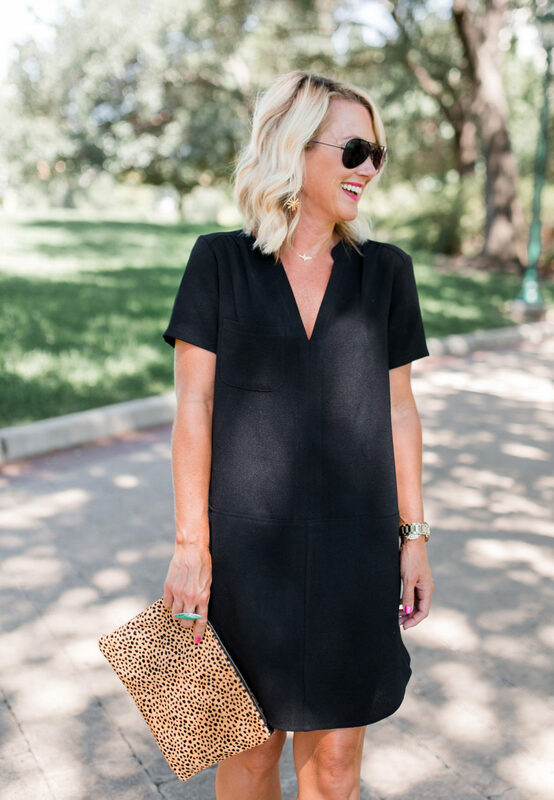 I love the weekend look with the leopard clutch and those adorable booties! And that heartbeat necklace is so unique! 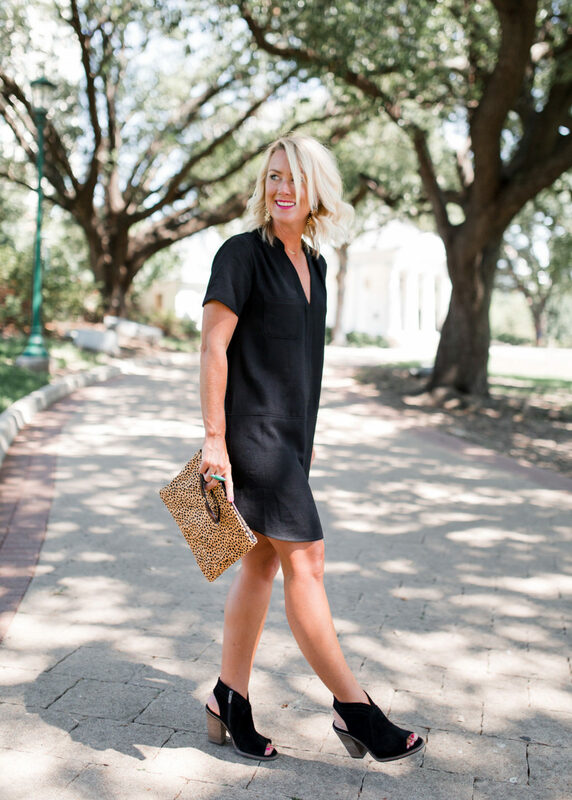 This LBD comes in my favorite… a Little NAVY Dress! Great color options. My husband has also been insisting on adding a band at 20. I am gunning for the “other” hand because my short and pudgy fingers do NOT need another band on my left hand!!!!! 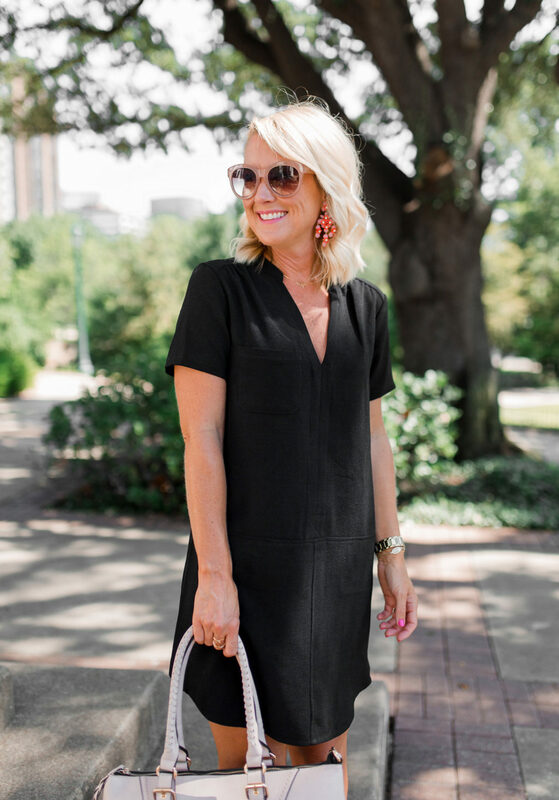 You can never go wrong with a LBD! 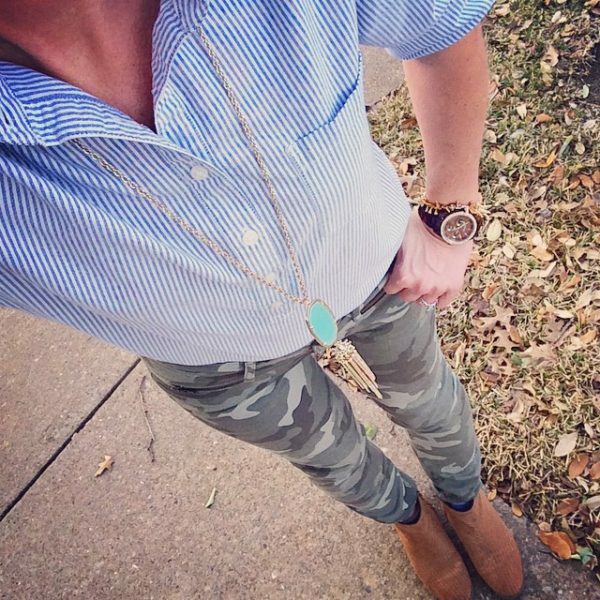 Love how you styled it. I havent purchased this dress yet as it’s dry clean only. Are you dry cleaning or machine wash and line dry? Thanks. I have this dress too! I’ve got it in black and love it so much I’m thinking of adding the wine color! It really is great for so many different types of occasions! Ooooo… this is great, but looks short! I know you are petite, so I am worried. I am 5’6″. Anyone this tall purchase it? I’m 5’6 1/2″, have long legs, and am 47 years old. It’s long enough for me to be comfortable in public. Thanks for this info Kelly! Adorable! I’m going to give it a shot and cross my fingers it’s not too short! I have my grandmother’s ring that my grandpa designed for her in 1979. My grandpa got the diamond from my grandmother’s mom’s engagement ring as the original ring fell apart. She wore it on her right hand. When she died in 1999, my aunt wore it and then gave it to my husband to propose to me in 2001. We had a wedding band designed to go with it & I got a matching one on our 10th anniversary. I LOVE it. It’s the perfect blend of my grandparents & new family. Get another band but you will not regret either decision!!! I ordered this dress and had to return it. I must be the only person on the planet that it looked bad on because I see it on so many bloggers. It just swallowed me up and kinda looked like a bag on me. I wish I looked like you do in it, you look gorgeous!